In the open source and free software movement, we always exalt community, and say the people coding and supporting the software are more valuable than the software itself. Few communities have planned and philosophized as much about community-building as ZeroMQ. In the following posting, Pieter Hintjens quotes from his book ZeroMQ, talking about how he designed the community that works on this messaging library. There are, it has been said (at least by people reading this sentence out loud), two ways to make really large-scale software. Option One is to throw massive amounts of money and problems at empires of smart people, and hope that what emerges is not yet another career killer. If you’re very lucky and are building on lots of experience, have kept your teams solid, and are not aiming for technical brilliance, and are furthermore incredibly lucky, it works. But gambling with hundreds of millions of others’ money isn’t for everyone. For the rest of us who want to build large-scale software, there’s Option Two, which is open source, and more specifically, free software. If you’re asking how the choice of software license is relevant to the scale of the software you build, that’s the right question. The brilliant and visionary Eben Moglen once said, roughly, that a free software license is the contract on which a community builds. When I heard this, about ten years ago, the idea came to me—Can we deliberately grow free software communities? Video systems can streamline hospital care in all sorts of ways from displaying messages (“Quiet time is 1 to 2 PM today”) to taking patient surveys, showing patients their X-Rays, and helping patients view their records from their beds. But most of these systems lie outside the budgets of small and rural hospitals. Healthcare Information is halving the costs of the systems, largely by deploying Android in their sets, and is selling them to smaller healthcare institutions that could not afford them before. The use of Android also permits hospitals to choose among the hundreds of thousands of standard apps available in App Stores. I had a chance to listen in a recent meeting of Open Health Tools, a trade association bringing together companies, academics, and standards bodies who create open source software tools for all stages of the health care field. Open Health Tools has been around since 2007 and is attracting some impressive new members. The achievements of this “ecosystem” (as they call it) may soon put to rest the dismissive attitude many people in health care have toward open source. Free and open source software has lots of barriers yet to overcome in health care, similar to but in a somewhat different configuration from the barriers in other fields where it has triumphed (government, finance, commerce). Liability is at the top of everyone’s mind in health care. They have to be assured that J. Random Hacker has not just checked in a poorly tested update to the program they’re installing on their ICU monitoring station. There are many responsible stewards of open source EHRs (several packagers of the VA’s VistA project, as just one example, have spoken at our Open Source Convention) but the buyers have to understand better what is entailed in vetting and maintaining open source software. Like a living species, software evolves as code is updated and functionality is improved. Software of low utility is dropped as users select better tools and drive forward functionality to meet new use cases. Open source culture demonstrates how a transparent approach to sharing software practices enables problem areas to be identified and corrected accurately, cost-effectively, and at the pace of change. A new open source file system that takes up half the space and runs significantly faster than HDFS is now available for Hadoop thanks to a firm named Quantcast. Their Quantcast File System (QFS) is being released today under an Apache 2 license and is immediately available for free download on GitHub. Organizational stabilization has been more of an urgent task for OpenStack than most community, open-source projects because it has grown to fast and so much is at stake in the computer industry. I reported on the creation of OpenStack a little more than two years ago and on the announcement that a foundation would be set up a little less than one year ago. This past Wednesday, the OpenStack Foundation came officially into existence. This week has been teaming with health care conferences, particularly in Boston, and was declared by President Obama to be National Health IT Week as well. I chose to spend my time at the second ITdotHealth conference, where I enjoyed many intense conversations with some of the leaders in the health care field, along with news about the SMART Platform at the center of the conference, the excitement of a Clayton Christiansen talk, and the general panache of hanging out at the Harvard Medical School. SMART, funded by the Office of the National Coordinator in Health and Human Services, is an attempt to slice through the Babel of EHR formats that prevent useful applications from being developed for patient data. Imagine if something like the wealth of mash-ups built on Google Maps (crime sites, disaster markers, restaurant locations) existed for your own health data. This is what SMART hopes to do. They can already showcase some working apps, such as overviews of patient data for doctors, and a real-life implementation of the heart disease user interface proposed by David McCandless in WIRED magazine. Patent ambushes are on the rise again, and cases such as Apple/Samsung shows that prior art really has to swing the decision–obviousness or novelty is not a strong enough defense. Obviousness and novelty are subjective decisions made by a patent examiner, judge, or jury. In this context, a recent conversation I had with Keith Bergelt, Chief Executive Officer of the Open Invention Network takes on significance. OIN was formed many years ago to protect the vendors, developers, and users of Linux and related open source software against patent infringement. They do this the way companies prepare a defense: accumulating a portfolio of patents of their own. Who has the gumption to jump into the crowded market for collaboration tools and call for a comprehensive open source implementation? Perhaps just Miles Fidelman, a networking expert whose experience spans time with Bolt, Beranek and Newman, work on military command and control systems, a community networking non-profit called the Center for Civic Networking, and building a small hosting company. Miles, whom I’ve known for years and consider a mentor in the field of networking, recently started a Kickstarter project called Smart Notebooks. Besides promising a free software implementation based on popular standards, he believes his vision for a collaboration environment will work the way people naturally work together — not how some vendor thinks they should work, as so many tools have done. 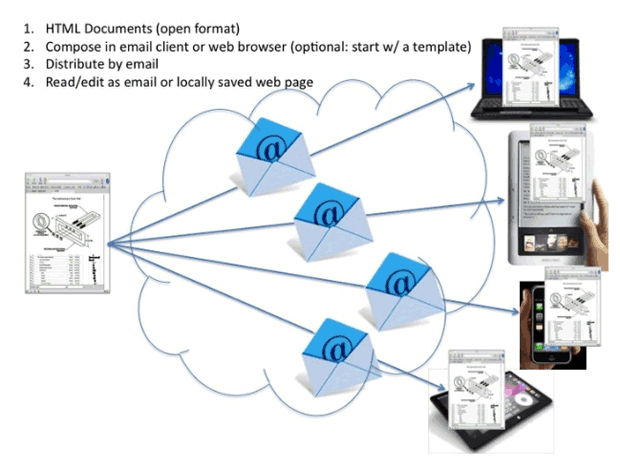 Miles’ concept of Smart Notebooks is shared documents that stay synchronized across the net. Each person has his or her own copy of a document, but they “talk to each other” using a peer-to-peer protocol. Edit your copy, and everyone else sees the change on their copy. Unlike email attachments, there’s no need to search for the most recent copy of document. Unlike a Google Doc, everyone has their own copy, allowing for private notes and working offline. All of this will be done using standard web browsers, email, and RSS: no new software to install, no walled-garden services, and no accounts to configure on services running in the cloud.